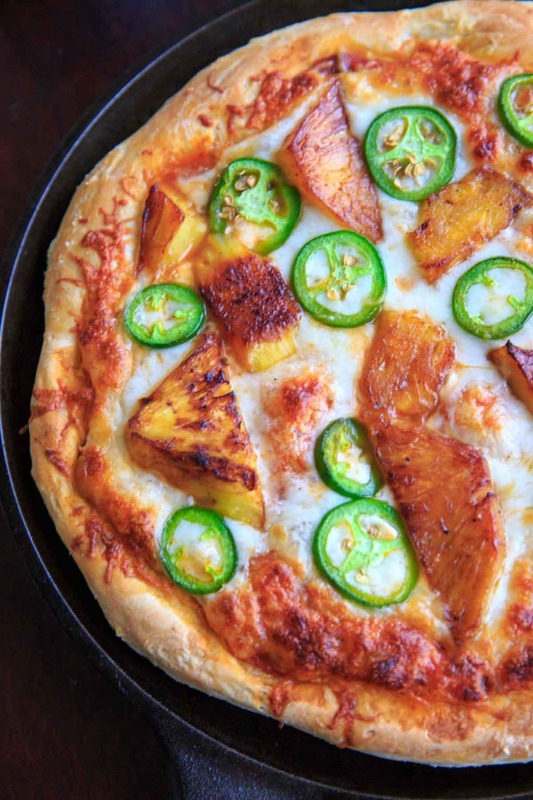 Grilled pineapple and jalapeno pizza. Sweet and spicy combo for people who like their pizza with a twist! Hi, hello! I’m currently writing this while it “feels like” 108°F outside (and also have the Mmmbop song stuck in my head, which is unrelated) and yet all I can think about is this pizza. It’s a rare day that I would turn down a slice of freshly homemade pizza, even when it’s triple digits outside. Especially one with my favorite toppings (i.e. THESE). Pizza knows no season. 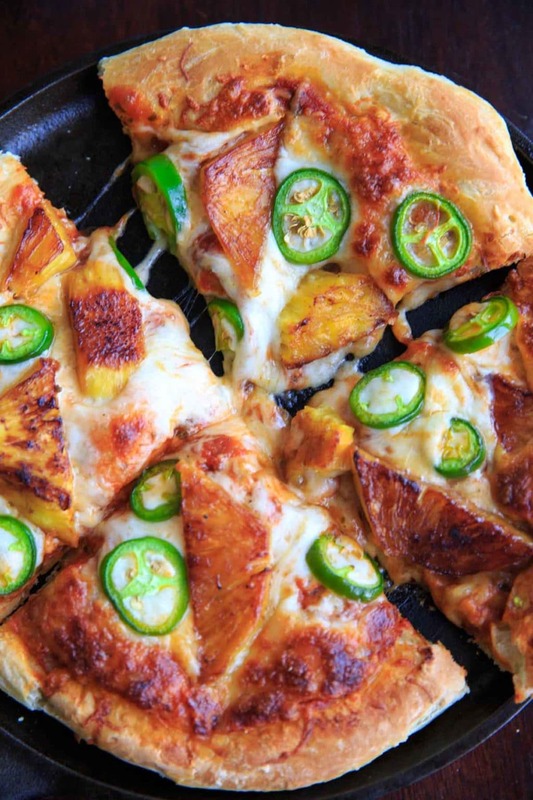 But if you ARE making it in the summer, this recipe is perfect for pizza on the grill night! 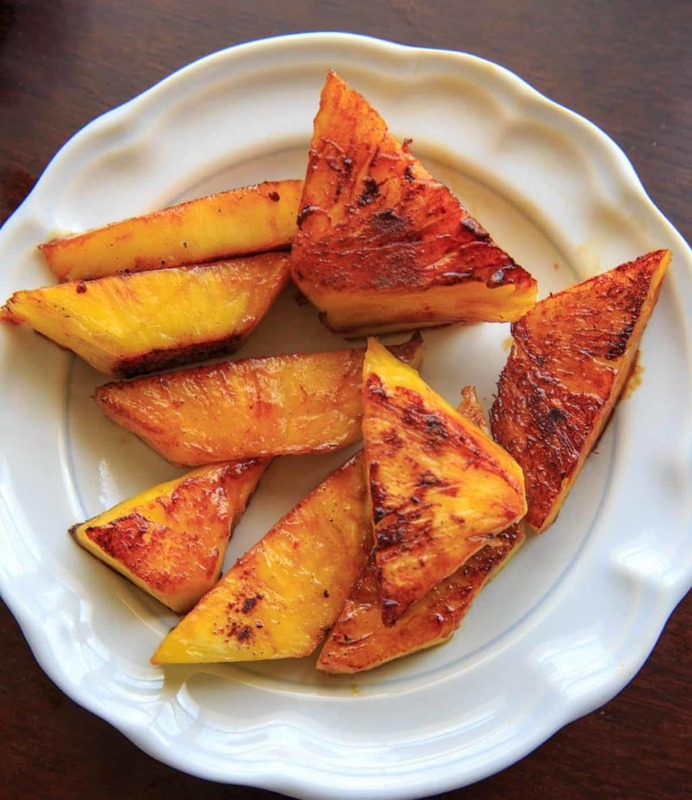 I don’t have an outdoor grill, so my “grilled” pineapple is made on the stovetop, but I’ve included info on how to make it on the grill. Pineapple as a pizza topping is a very controversial topic. The first time I heard of it, I definitely thought it was weird. Luckily I was brave enough to try it and then it became my favorite! 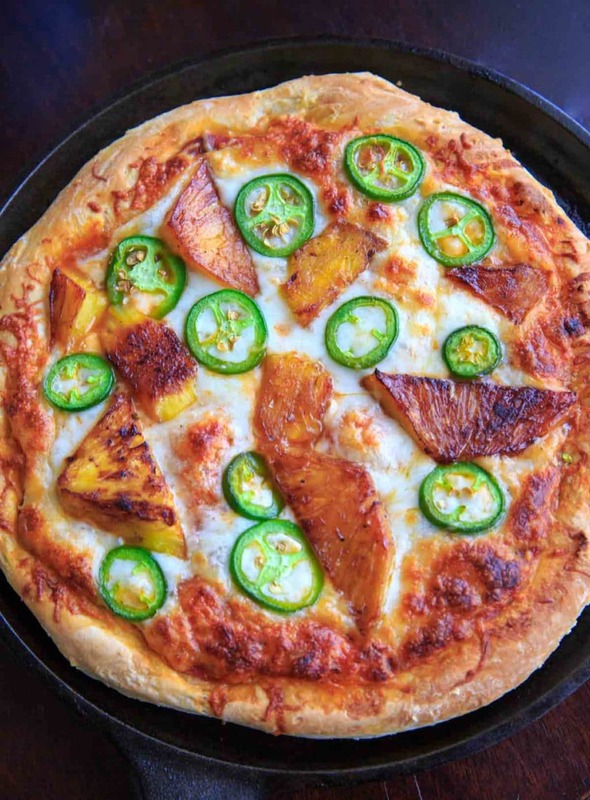 When I discovered my love of spicy foods as well and started adding jalapeno to my pizza, jalapeno + pineapple became my new favorite go-to combo. Sweet and spicy, I can’t get enough. If you, like Gordon Ramsay, think pineapple on pizza is an “Italian tragedy,” I’ll direct you to a pizza with more traditional toppings. I wanted to do a twist of this favorite for you, so this time I jazzed it up a little by grilling the pineapple. Adding a little honey to the pineapple and cooking adds an extra sweetness and draws out the flavor. If you are a spicy lover like me, you can also add a little hot sauce! If you want to get really intense, you can also grill the jalapenos. Some people say this makes them sweeter, but I usually find it makes it spicier! Though jalapenos spice level varies from pepper to pepper, so it might just be luck of the draw. If you DON’T like spicy, leave off the hot sauce for the pineapple, and take out the seeds of the jalapeno. Homemade pizza crust (or store-bought) – check. Homemade marinara sauce (or store-bought) – check. Even when it’s hot as the sun outside – check. Tell me – what are YOUR thoughts on pineapple on pizza? Option 1: On stovetop: heat oil in a cast iron pan on high heat. In a small bowl or ziploc bag, cover the pineapple with the honey, lime juice, and a dash of hot sauce (if using) and toss to coat. When oil is hot, cook on medium-high heat for 2-3 minutes on each side. Set aside. Option 2: On grill: In a small bowl or ziploc bag, cover the pineapple with the oil, honey, lime juice, and a dash of hot sauce (if using) and toss to coat. Thread pineapple chunks on a skewer and grill for 4-5 minutes. Set aside. Roll out pizza dough to desired thickness and shape (I use a 10 inch cast iron pan). 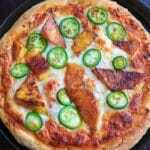 Pour marinara sauce on and evenly coat the pizza dough with the back of a spoon or spatula. Top with shredded cheese. Add sliced jalapeno and grilled pineapple from step 1. Bake at 475° for 12-15 minutes or until cheese is melted and crust is browned. If you want to grill the pizza instead of bake it, see -> this article <- from the Kitchn for tips on how to cook a pizza on a grill. *Option to not grill the pineapple first and just add it to the pizza fresh and as-is! 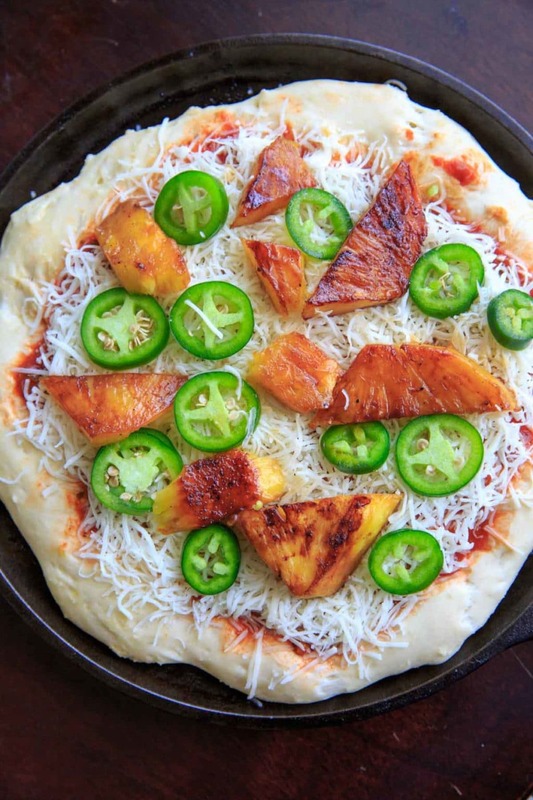 Pineapple + jalapeno pizza is my personal favorite. It looks amazing! Pineapple on pizza is so much better than it sounds. It’s one of my favorites as well. Your pizza looks so delicious! What a super combination for a pizza topping! I have to try this out for myself soon! I’m with you — pineapple on a pizza is a big YES! I especially love the jalapenos for a kick. I want to make this one! How perfect! Pineapple and jalapenos! Yum. I, for one love pineapple on pizza, especially with ham. I am going to try your recipe soon. You have beautiful photos! ANybody who says pineapple doesn’t belong on pizza is now friend of mine. This looks AH.MAZING.